What is the MORStopTM Tilt-Brake? The unique MORStopTM Tilt-Brake automatically stops and holds the drum tilt angle! It is a simple, compact anti-backdrive device which functions smoothly and quietly in both directions. Without the MORStopTM Tilt-Brake, a heavy unbalanced drum may tilt out of control. 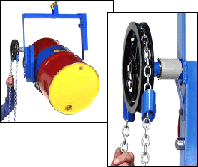 Operators may need to manually lock the pull-chain or hand crank to prevent unwanted drum rotation. The MORStopTM Tilt-Brake eliminates this need. The MORStopTM Tilt-Brake option is available on many models in the Morse Drum Karriers and also fits any manual tilt product using a Morse style gear block. installed on your new drum handler. for field installation on your existing unit. separately as part # 5U-P.
- Eliminates backdrive from heavily loaded, unbalanced drum. from one end of drum to the other as you turn it. with Chain-Wheel, Hand Crank or Hand Wheel for manual drum tilt control. It also fits many manual-tilt products using a Morse style gear block. The MORStopTM Tilt-Brake extends the tilt control 3" (7.6 cm). 3900i-P MORStopTM Tilt-Brake factory installed on new drum handler 3 Lb. 3900-P MORStopTM Tilt-Brake Kit for field installation 3 Lb. (1.4 kg) L8" W7" H3"
3900SSi-P MORStopTM Tilt-Brake with stainless steel casing factory installed on new drum handler 3 Lb. 3900SS-P MORStopTM Tilt-Brake Kit with stainless steel casing for field installation 3 Lb. 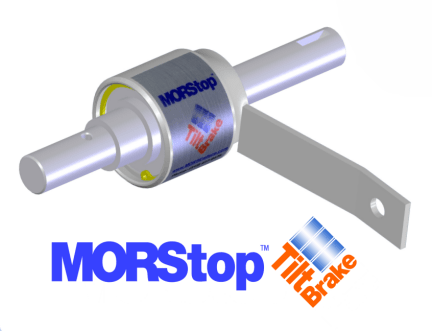 MORStopTM Tilt-Brake automatically stops and holds the drum tilt angle.